Seals are a stylish replacement of signatures. Today everything is digital, but the old-fashioned ways have a much larger spell for us. 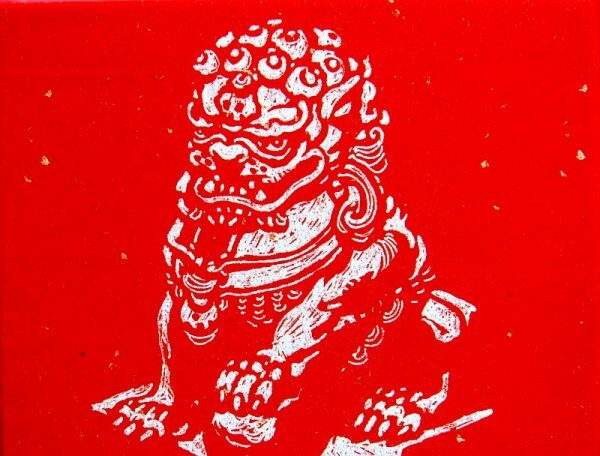 When you see imprinted seal on your letter, you not only know, that nobody has been digging through your correspondence, but above all, you will have much more respect for contents of that envelope. The marriage of fire, wax and iron is simply romantic. 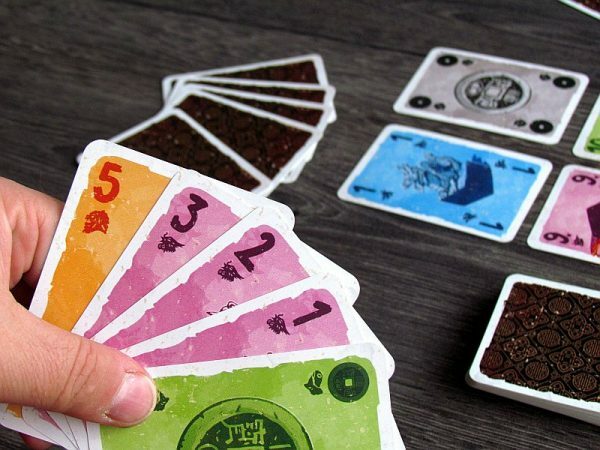 Small Seals card game was prepared for us by three designers, Frank Crittin, Grégoire Largey and Sébastien Pauchon, and they created something really unique. 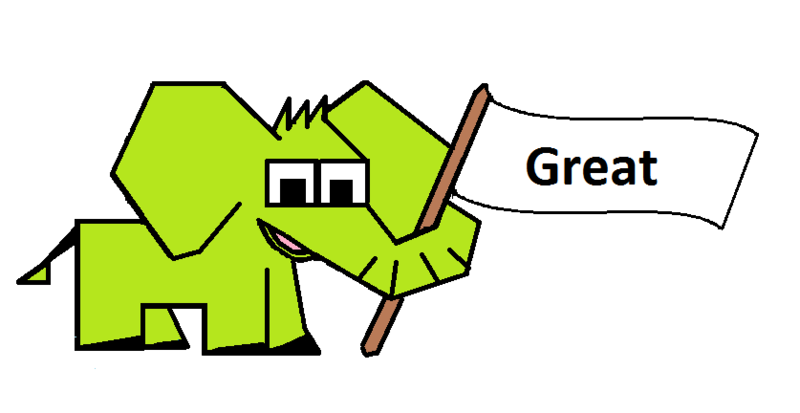 Outcome of their work also impressed Mandoo Games company, as they prepared this news for publishing in second half of 2018. Vincent Dutrait took care of the illustrations and the whole game will be presented at the Spiel 2018 fair in Essen. But we could taste it in full version sooner. Everything is hidden in a small reddish box with one possibly seal picture on the lid. 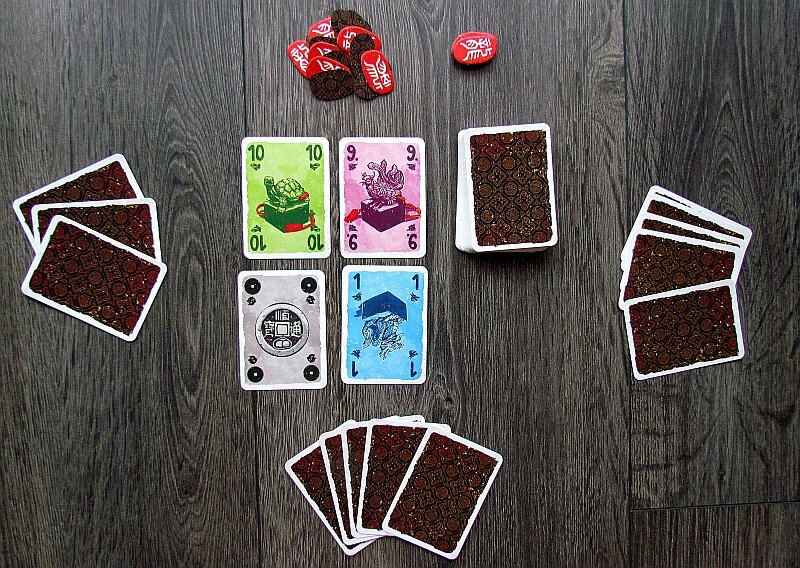 Inside, players have a total of fifty-five cards, that represent five colors, eleven pieces in every color. They are always numbered from one up to ten and the eleventh is a coin. All this is complemented by tokens. 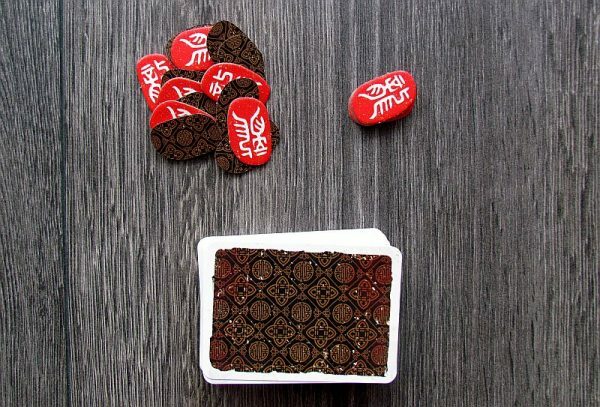 Players will shuffle the package, place it in the center of the table, and create a random pile of five tokens from the stock of cardboard chips to create a round counter. Games are divided into turns, in which there is always only one active player. He reveals four top cards from the deck and selects a set, he is interested in. 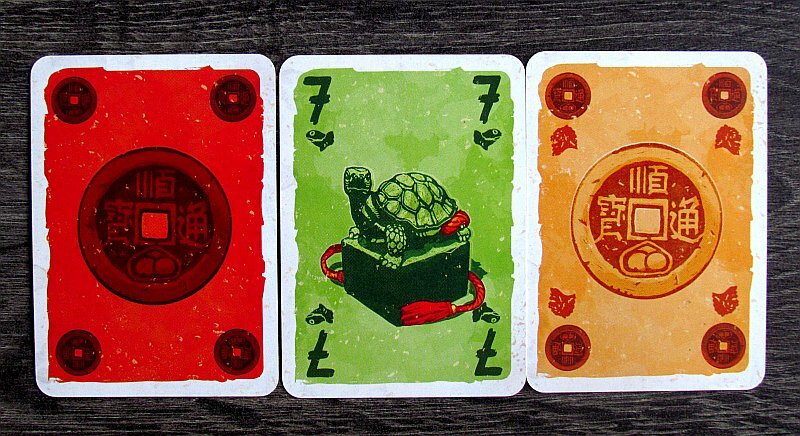 These picked up cards must always share either number or color. 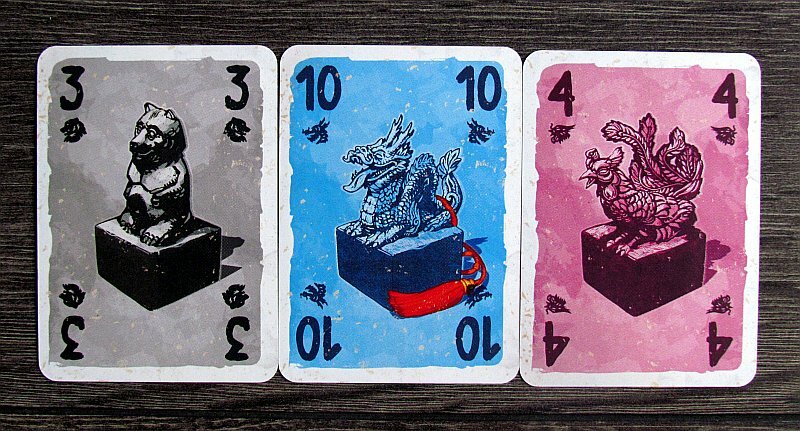 Sometimes, of course, there may be four cards, that have nothing in common. In that case, the player must select only one. Other times, player can get even all four. 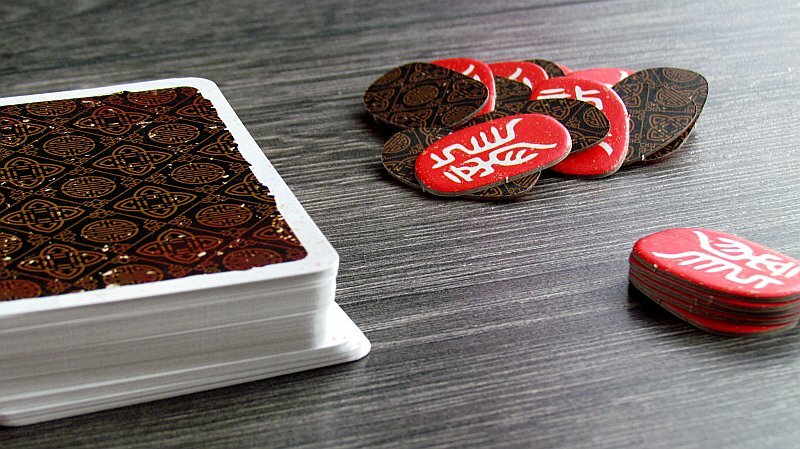 Trying to put together sets reminds us somewhat of poker alternative. Players try to score four cards of the same value and colors or create a complete straight from one to ten. Such a collection can immediately be revealed from hand, scored and thus end the current round. Depending on the difficulty of the generated combination, player receives a reward in the form of one or more tokens. 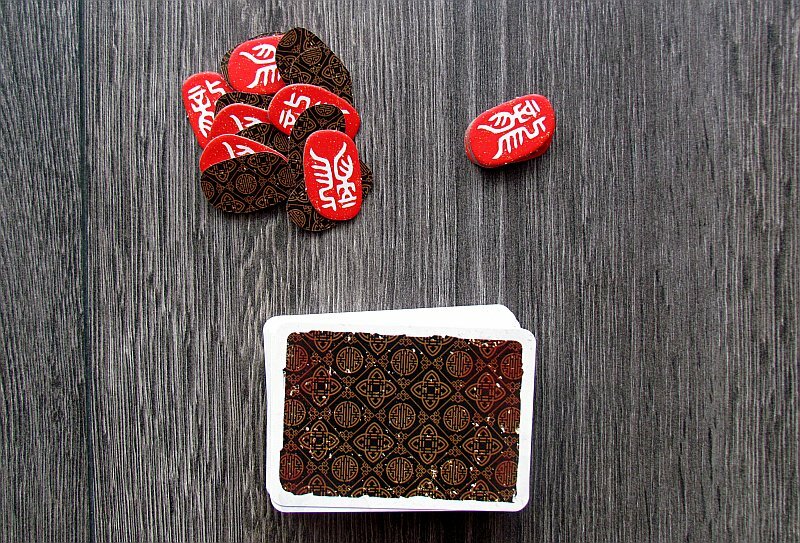 The first one is taken from the token stack (created during setup) and hence lowers number of remaining rounds by one. Starting player changes with every round and game continues to the next. Players then pick up cards, create new sets again and again until one of them collects five or more tags. Such a player can celebrate victory. However, if the fifth round ends and no one has the required number of points, the game is still over and the one, who has the most chips, wins. 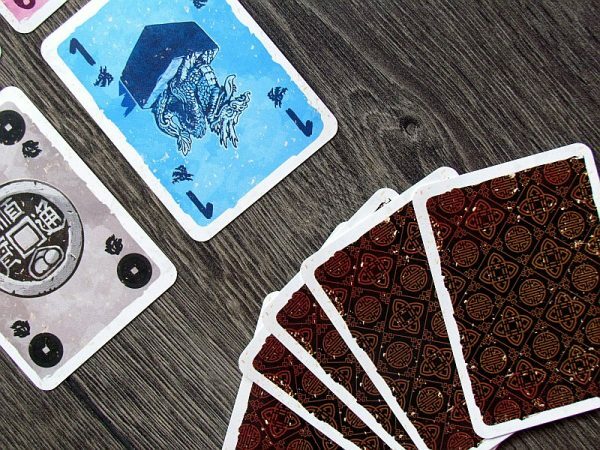 Seals is a game, that shows, that even simple card games still make sense. There is no direct rivalry, just collecting cards and unloading them. And yet the game is strangely entertaining. And there’s nothing at all about it to highlight it on paper. But perhaps this simplicity has made us like it. Especially on the road, it is an excellent speed train, which is always successful. 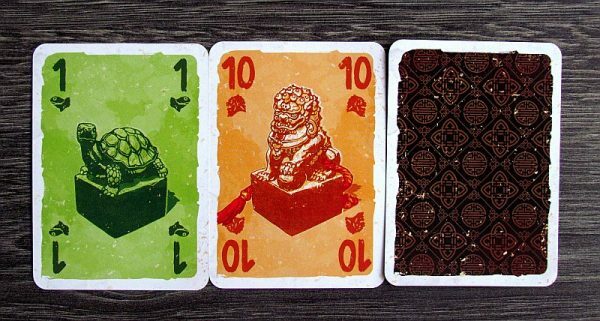 Players need luck to get a good four-card offer of some convenient combination. The chance to collect more cards in one turn is a great twist. Often, you get cards, that are useless at first, but later they can get useful. You also need to consider, when and how to play the set. You will get rid of all the other cards in your hand (by ending the round), and thus the chances of a better score, if you have a better combination starting to appear in your hand. The game is pretty fast as expected. Players quickly collect and do not have much to think about. As a result, the turns are quick and the whole match spreads across a maximum of five rounds does not exceed fifteen minutes. At the same time, thanks to simple rules, the game is also suitable for beginners and children, who only need to know the numbers. 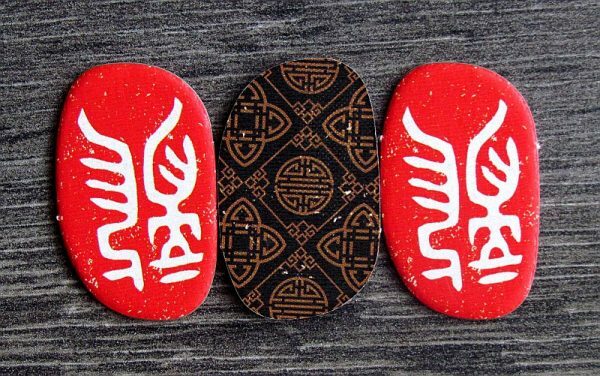 Although theme itself is present only as a background spirit, it does not have an impact on the overall excellent feeling of Seals. The game is of course random, but it belongs to its filler concept of entertainment. 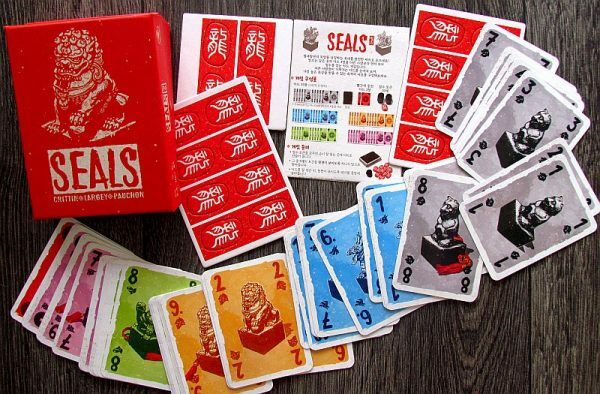 Seals seams to us as a pure card game. Seals brings to us an interesting card world, that revolves around seals. Players choose cards from a random offer, they make sets in hand and eventually they can play them. The matches are beautifully fast and unexpectedly fun. 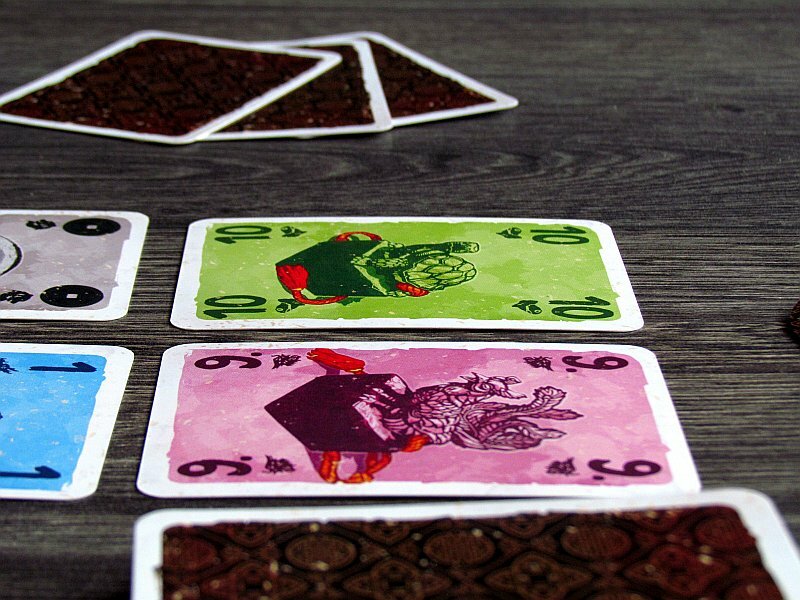 The game offers solid tactical capabilities, although it is even subordinate to chance and luck can thus influence player's chances of success. But Seals are primarily a light travel fun and fits perfectly into this category.